Two distinct ferrate, both accessible from Gardena pass. They are short. Both can be completed in a half-day. Both offer similar views - however the Grosse Tschierspitze is almost nothing more than a walk-up, whereas the Tschierspitze V has actual climbing and exposure, along with a neat little pinnacle of a summit. Starting from one of the parking lots very close to the summit of the Gardena pass, choose a trail or walk up open ski slopes and pastureland to the north, towards the jagged ridgeline. The Grosse Tschierspitze is clearly visible, sporting a large cross on its summit; The Tschierspitze V is the fifth peak from the left of the Grosse Tschierspitze. Behind you to the south, the northern flanks of the Sella group are very close. Path on the way to the Grosse Tschierspitze. Once above the ski area, choose a path that leads east below the cliffs, keeping in mind that you must ascend the deep gully to the left of the Grosse Tschierspitze itself. The path will lead into and up the gully, where you will find the first bit of wire. The ferrata section is very easy, and could be walked without the aid of a wire, although there is a bit of exposure. After this initial section, the route alternates between un-aided path and sections of wire. The route switchbacks back and forth until soon the summit is reached. There are many nice views down into the Gardena Pass area on the way up. The Tschierspitze V is considerably more of a challenge than the Grosse Tschierspitze (although in the grand scheme of things they may not mean much since the GT is so easy). Although the T.V. short, it is steep and has lots of exposure. If you like that kind of thing, this little Ferrata is a great warmup! As mentioned earlier, both this and the Grosse Tschierspitze can be completed in half a day. Either one could be completed in 2 to 3 hours. When hiking up from the pass, keep in mind that the Tschierspitze V is the fifth major peak left from the Grosse Tschierspitze (which itself is indicated by a big cross on the summit). When you get above the ski lifts, make sure you aim for the ridge at the foot of this fifth peak. Follow the ridgeline upwards. You should notice some red blazes here and there, and the ridgeline should have a small gulley near it that leads up, parallel with it (again, there are some red marks that should help guide you). After not very long (maybe 100m or so in altitude), you should arrive at the start of the ferrata, right on the crest of the ridge that leads south from the peak. The wires start up immediately exposed and airy and steep. 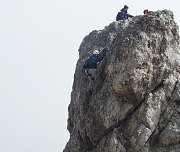 There are one or two small platforms, and then the final summit block is reached, which has one more short steep section of ferrata. The summit itself is a neat tiny pinnacle with lots of exposure everywhere. Lots of fun! Just to the north of the summit pinnacle a bit of ferrata leads down into the large gulley separating the Tschiersptize V with the next summit (which I presume would be named the Tschierspitze IV, but I'm not sure). This is the descent route; soon the wire ropes end and it is just a simple scramble down the gulley to the area near the start point of the ferrata. This is quite a fun short route. An excellent introduction to a more difficult ferrata; very short!